Made of rust and scratch resistant Stainless Steel with a rubber-edged base. 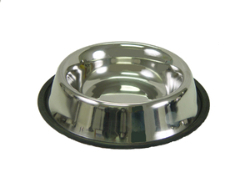 The rubber-edged base is designed to prevent movement and spillage during feeding. Comes in sizes from 16 oz. to 96 oz.